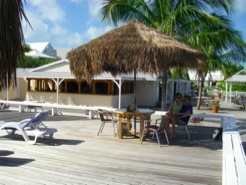 Green Turtle Cay Map with facilities and attractions. Air service is available through Marsh Harbor International and Treasure Cay airports. The Green Turtle Ferry provides service to airport dock at Treasure Cay. The area between the entrances to White Sound and Black Sound provides a good anchorage in settled conditions. The Wrecking Tree Restaurant & Bar, Bakery & Take Away; 242-365-4263; VHF Ch 16. McIntosh Restaurant & Bakery; 242-365-4625 Open 0900 - 2100. Plymouth Rock Liquors & Cafe; 242-365-4234. Reef Rentals; 242-365-4245; VHF Ch-16; rentals@batelnet.bs. Green Turtle Club has a book exchange in its lounge for use of guests. 242-365-4113; Fax: 242-365-4390. The office is located on the hill in New Plymouth next to the radio tower. Office is open only on Thursdays (Feb 2018). Plymouth Rock Liquors & Cafe; 242-365-4234. Coffee, pastries breakfasts. There is a Customs Officer but not an Immigration Officer at the Administrative Center / Post Office building; 242-365-4077. As of Feb 2018, the procedure is to call the office, secure an appointment, then go to the office in New Plymouth. There are several dinghy landings: Bluff House, Green Turtle Club, Curry’s Food Store, Pineapple’s Bar, government pier. Captain Roland Roberts House. An environmental center run by Reef Relief of Key West. BASRA has an operation at Bluff House; 242-365-4200; VHF Ch-16. Green Turtle Cay Ferry; 242-365-4166/4218; VHF Ch-16 Service between Green Turtle Cay and Treasure Cay, Airport Ferry Dock. Note: contact ferry for pickup from White Sound. Taxis usually are waiting at Treasure Cay Ferry dock. Abaco Fly Fish Connection; 242-365-4261. Green Turtle Club; 242-365-4272. Charter fishing can be arranged. Abaco Seafood Ltd.; 242-365-4011 / 4012. Bluff House Marina; 242-365-4247/4200 & 800-745-4911 (US); blufhouse@oii.net; Texaco StarPort with diesel and gas. Green Turtle Club; 242-365-4271 / 4272; diesel and gas. D&P Cart Rental at Green Turtle Club; 242-365-4271 / 4272. Kool Kart Rentals; 242-365-4140; kookkartrentals@hotmail.com. Curry’s Sunset Grocery; 242-365-4171; VHF Ch 16. Located at the harbor front. Customer docking, homemade bread, groceries, frozen foods, fresh fruits & vegetables, block and crushed ice. David's Gourmet Greens. Hydroponically grown basil, cilantro, heirloom tomatoes, watercress, and other greens. Sid's Food Store; 242-365-4055 / 4612. This store has a broad selection of groceries. Robert’s Hardware & Marine; 242-365-4122. Curry’s Sunset Grocery; 242-365-4171; VHF Ch 16. Three Sisters Ice-Cream Shop; 242-365-4625. Bahamas Wimax; 242-367-3717. Strong WiFi in anchorages. Out Island Internet; 242-367-3006 . Strong WiFi in anchorages. Bluff House. Free wifi to customers. Green Turtle Club. Free wifi to customers. Leeward Yacht Club; free wifi to customers. Abaco Yacht Services; available to customers. Black Sound Marina; available to customers. Bluff House; available to customers. Green Turtle Club. 6 washers and driers; available to customers. Leeward Yacht Club; available to customers. 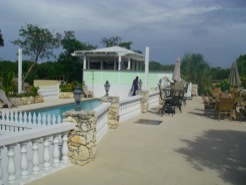 Bluff House Beach Hotel; 242-365-4247 & 800-745-4911 (US); blufhouse@oii.net. Hillside villas, pool, bar, restaurant, marina. Green Turtle Club; 242-365-4271 & 800-370-4468; 866-528-0539; info@greenturtleclub.com. Roberts' Cottages & Bank Apartments; 242-365-4105. Linton's Beach & Harbour Cottages; 772-538-4680; info@lintoncottages.com. New Plymouth Inn; 242-365-4161. Quiet colonial charm with patio, pool, garden, restaurant and bar. The mailboat arrives on Thursdays. Black Sound Marina; 242-365-4567 / 4531; VHF Ch 16. Bluff House Marina; 242-365-4247 & 800-745-4911 (US); blufhouse@oii.net. 38 slips; pool; laundry. Green Turtle Club; 242-365-4271 & 800-370-4468; 866-528-0539; info@greenturtleclub.com. 45-slips; electricity; water; pool; restaurant; guests have use of resort facilities. Free wifi. Free dockage special 2012: dock fees will be offset by food and beverage purchases. Checkout time: 1100. 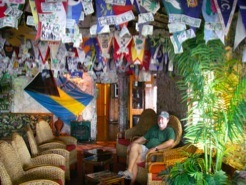 Leeward Yacht Club; 242-365-4191; info@leewardyachtclub.com 28-slip marina; laundry; pool; bar & grill; wifi; residences. Abaco Yacht Services; 242-365-4033 / 4216; ays@oii.net Located at Black Sound. Green Turtle Shipyard; 242-365-4033; ays@oii.net; VHF Ch 16 Yamaha outboard sales & service. Full service yard. Other Shore Club in Black Sound. Entrance to White Sound. The entrance channel to white sound was dredged in late 2013! With the Green Turtle Club leading the way and Bluff House joining in, a steel impact wedge was used to cut through the infamous rock sill across the entrance to White Sound between the two outer marking posts. The inner channel was also cleaned up. CC 14 Jan 2014 SV Onward transited the improved White Sound channel at 1600 hrs. The tide data for the Green Turtle Cay tide reference station (Navionics) predicted a tide of 1.5' above datum. Onward draws 6.2' and saw a minimum of 7.1' between the two entrance markers. This was a substantial improvement over previous passages where 2' of tide or more was necessary to just clear the bump at the sill. 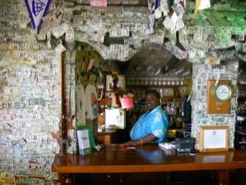 Green Turtle Club; 242-365-4271 / 4272; 866-528-0539 (US); info@greenturtleclub.com. Green Turtle Club; 242-365-4271 / 4272. Restaurant; Turtle Pool Bar & Grill. Harvey's Island Grill; 242-365-4389. Across from the Public Pier. 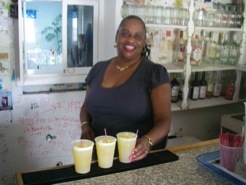 Lizard Bar & Grill at the Leeward Yacht Club; 242-365-4191. 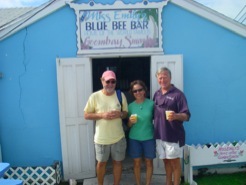 Miss Emily's Blue Bee Bar; The original home of the Goombay Smash! Plymouth Rock Liquors & Cafe; 242-365-4234. Sandwiches. Rooster Restaurant & Pub; 242-365-4066. The Wrecking Tree Restaurant & Bar, Bakery & Take Away; 242-365-4263; VHF Ch 16. Located on Bay Street in the corner of the harbor serving lunch and dinner. Post Office. Public restrooms are available. Captain Roland Roberts House environmental center. Restroom available. Restaurants and bars have restrooms for customers. Albert Lowe Museum & Gallery. Native Creations; 242-365-4206. Offers a wide selection of quality gifts and jewelry. Shavon's Home & Garden; 242-365-4081. Showers are available at marinas for customers. Brendal’s Dive Center; 242-365-4411; brendal@brendal.com; VHF Ch 16 White Sound. A&W Travel Service; 242-365-4161; a_wtravelsrvc@hotmail.com. Black Sound Cay National Reserve. Park. Roland Roberts House Environmental Center. There is a dumpster at government pier. Marinas provide trash bins for guests. Water is available at marinas. Green Turtle Club; $0.20 / gal. Water is now brought to Green Turtle Cay by pipeline from Great Abaco.